I have a ssh connection to a machine which gets disconnected by that machine after 30 minutes of no user input. However, if I start something like top, the connection stays alive. Since this is a client's machine, I can not reconfigure that machine's SSH server. So I am looking for a way to automatically detect idleness and start something like top. Kind of a "screensaver" for Bash. I know that I can do that with screen, but unfortunately screen is not installed, and I can not install software. So I need to use what Bash offers. To make it clear: I am looking for a solution that I start once after logging in, and then I want to use that terminal, walk away, come back two hours later and continue working, without typing anything before walking away. The problem is that there is something (usually a firewall or load-balancer), which is dropping idle sessions. If you configure session keepalives, the keepalives will prevent network devices from considering the session as idle. Type 60 into "Seconds between keepalives"
In addition to Mike Pennigton's answer, I would like to make you aware of ServerAliveCountMax too. The ServerAliveInterval will send a keepalive every x seconds (default is 0, which disables this feature if not set to something else). BUT this will only be done ServerAliveCountMax times. The default value of ServerAliveCountMax is 3 (see manpage ssh_config). Example: If you set ServerAliveInterval to 60 and leave ServerAliveCountMax as it is, this means the keepalive will only keep the connection alive for 3 * 60 = 180 seconds = 3 minutes. unix.stackexchange.com - What is the default idle timeout for OpenSSH? I am using Mobaxterm and have also met with this problem. Mobaxterm also ships with an option to keep the client alive when the client is idle. Go to Settings -> Configuration -> SSH. 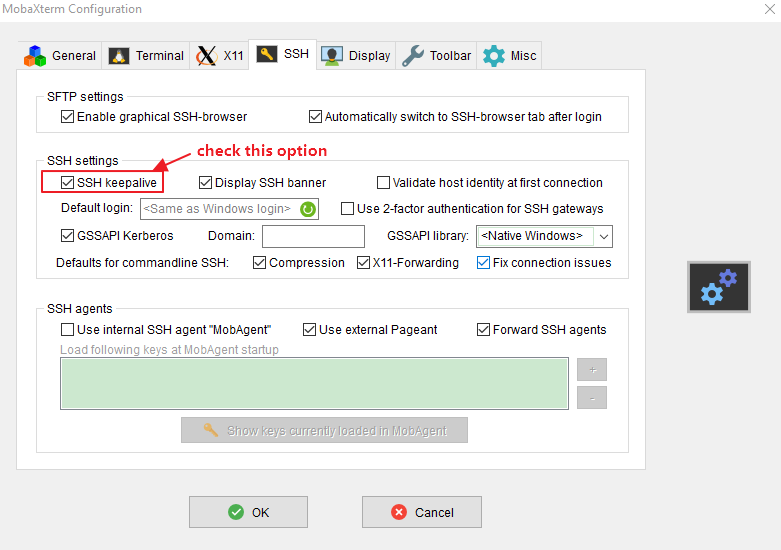 There is section titled SSH settings, check the option SSH keepalive. Then it the problem should disappear. How can I route *some* traffic over an SSH SOCKS proxy on OS X?